Guy Andrew Burns was born and raised in South Florida. 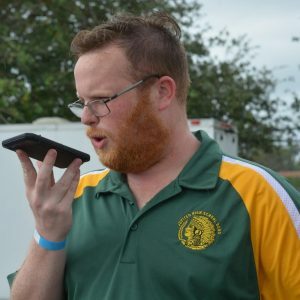 As an alumni of Jupiter High School and a founding member of the Spirit of Jupiter Marching Band, he has been involved with the Jupiter Band Program in several capacities since 2007. He was a member of the band for its 2007 BGA Sugar Bowl performance in New Orleans, as well as its 2008 BOA regional debut. After graduation Guy returned to help tech the front ensemble before taking a job teaching percussion for the Park Vista Striking Cobra Band. He also played in community orchestras and studied music education during this time. Wearing several hats, Guy is a staff member dedicated to the development of the student leadership team. Additionally, as the Director of Operations he is responsible for logistical operations of the band including but not limited to: facilities and equipment management, director/staff/parent liaison, planning & logistics, communications, band announcer, and event operations. He also serves as a general consultant to Mr. Ross and the band staff, as well as helps instruct the front ensemble. Guy is currently finishing his bachelor’s degree in Behavioral Sciences and Education at the University of Central Florida. Guy is a member of the Percussive Arts Society and the National Association for Music Education, and works for the Florida Federation of Colorguards Circuit.